On that note, make sure you pick something you can live with! 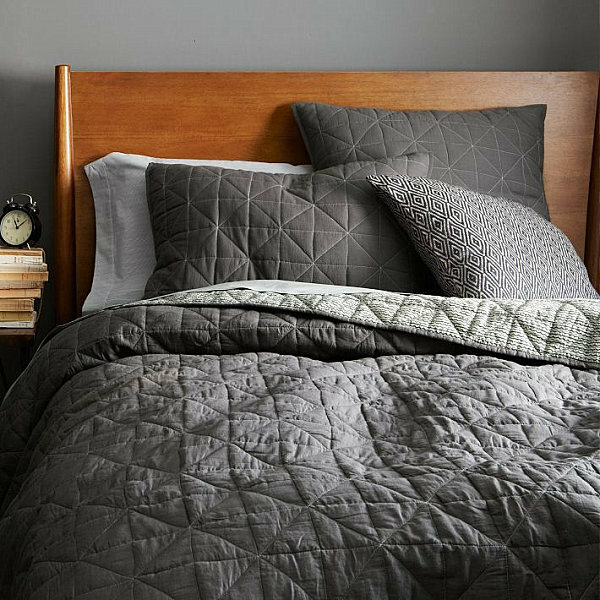 Whether it’s a favorite color or a striking pattern that first catches your eye, remember that a duvet or comforter really sets the tone for the bedroom. So you’ve gotta love it! If you do see something you love in the selections below, make sure you tell us about it in the comments section at the end of the post. Happy shopping! There’s just something about jade green. So if you’re going to showcase one color, why not make it special? 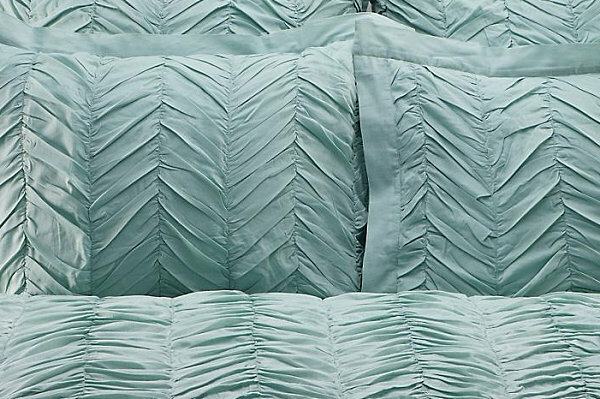 These Jade Bed Linens from Crate & Barrel are 100% cotton. They feature trellis-style stitching, and they are perfect for combining with printed sheets. 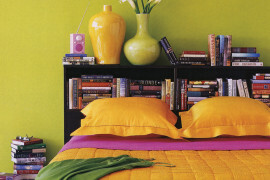 Or you could bring on the color blocking style by going with another solid in a contrasting hue! Ready to get fancy? It’s hard not to admire the ornate style of this Gianna Bedding in Venetian Blue from Z Gallerie. 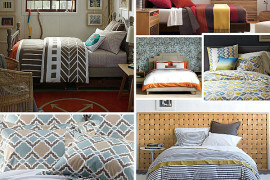 In fact, the ruching creates a chevron effect that puts a modern spin on this selection. You might think it’s fussy, but when you find out this bedding is 100% cotton, you’ll quickly see that comfort is of the utmost importance! Sometimes you just have to go bold with an unexpected color choice for bedding. And for the record, purple isn’t just for kids’ rooms. This Solid Purple Brushed Twill Bedding from Lacoste is available through Macy’s, and it showcases a vibe that is both preppy and sporty! From solids to stripes…because nothing says “summer style” like vertical or horizontal lines, especially when a crisp shade of white is involved. Note: these stripes are special. 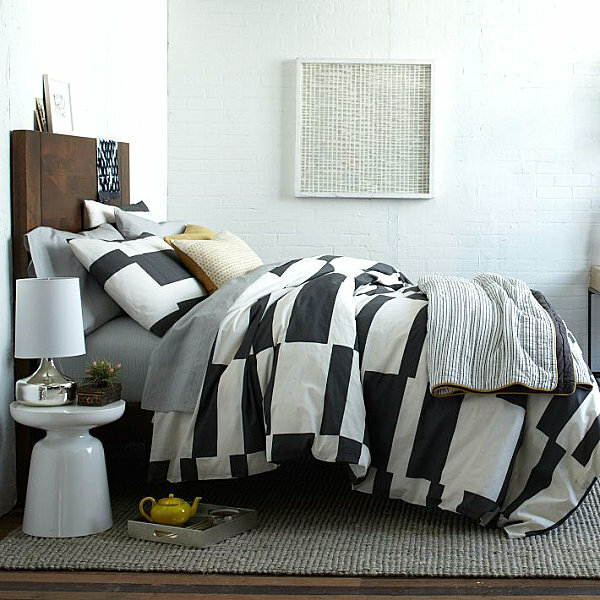 In fact this Offset Striped Layered Bed Set from West Elm has a truly eclectic look, thanks to the unique combination of thin stripes and geometric blocks. 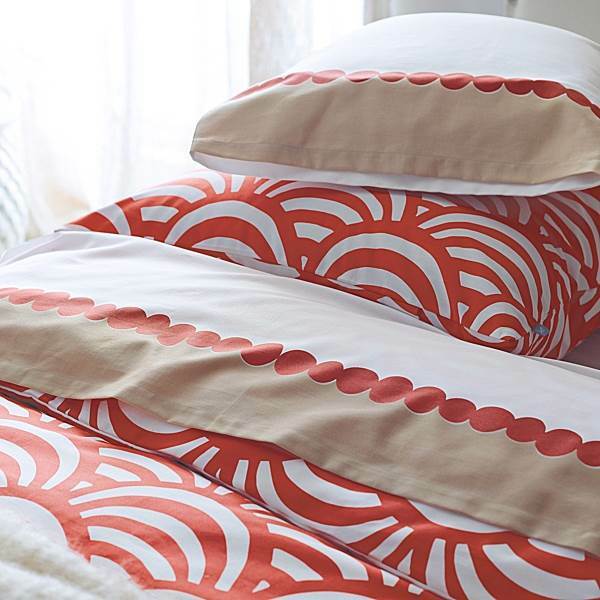 Included in the set are patterned cotton sheets, along with a graphic duvet cover and shams. In fact, we recently featured this selection in our post on summer decor! 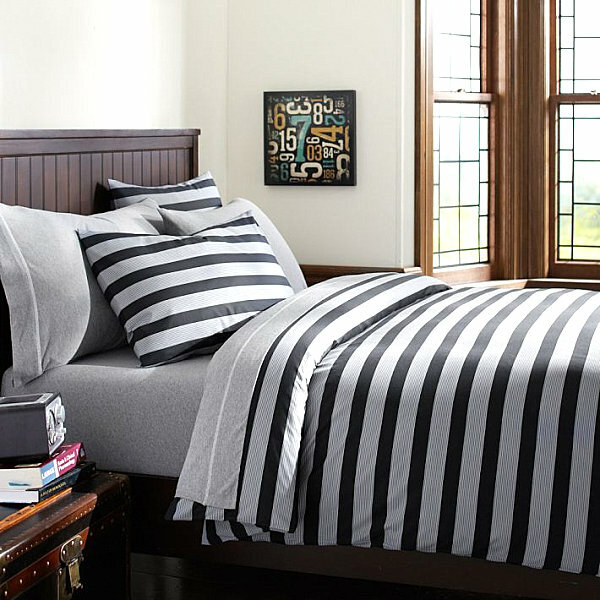 The next selection is actually from PB Teen, but we think this Brooklyn Stripe Duvet Cover + Sham could work for any age. The power of neutral stripes is heightened by the strong contrast between dark and light. Plus, horizontal stripes create a contemporary feel, don’t you think?! 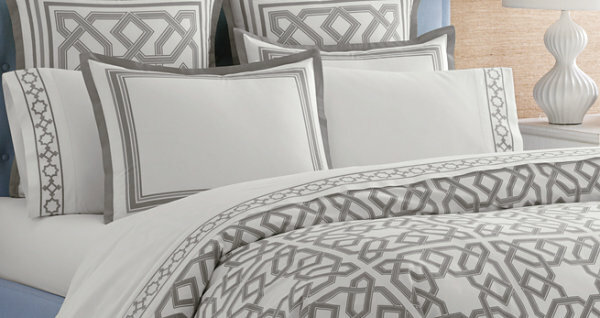 We end our roundup with a collection of patterned bedding finds. Because sometimes it’s interesting to add a print to the mix! 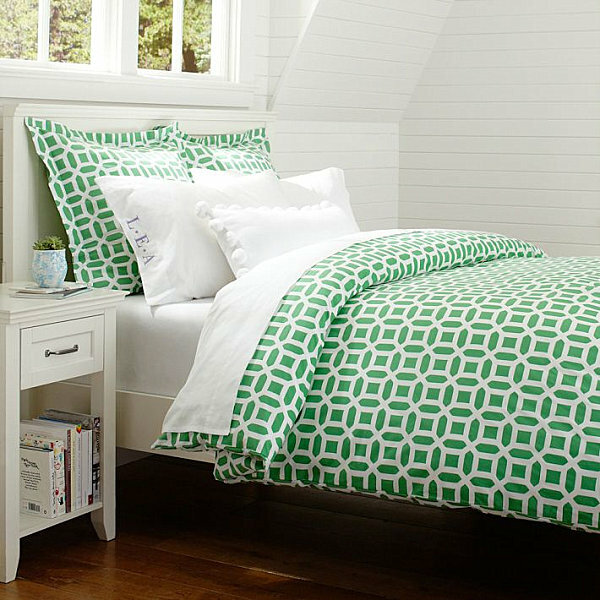 And if you’re not up for an entire patterned comforter, try adding pattern through sheets. 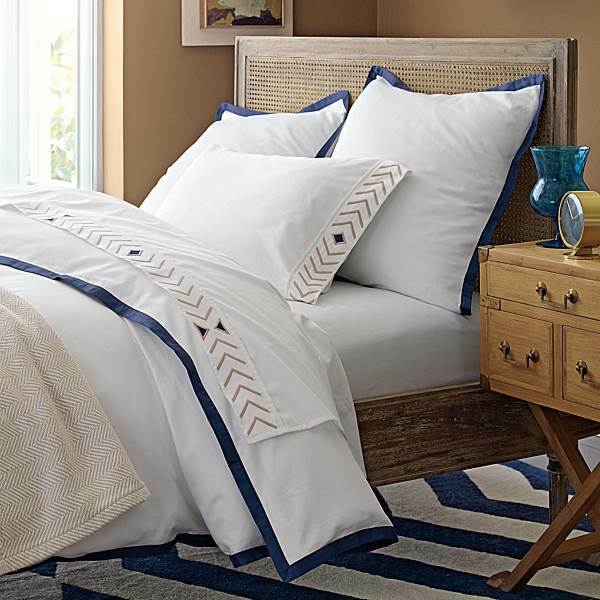 The Sand/Navy Canyon Sheet Set from Serena & Lily is inspired by the shape of a feather. The sheets are shown here with the Navy Border Frame Duvet and Shams, also from Serena & Lily. 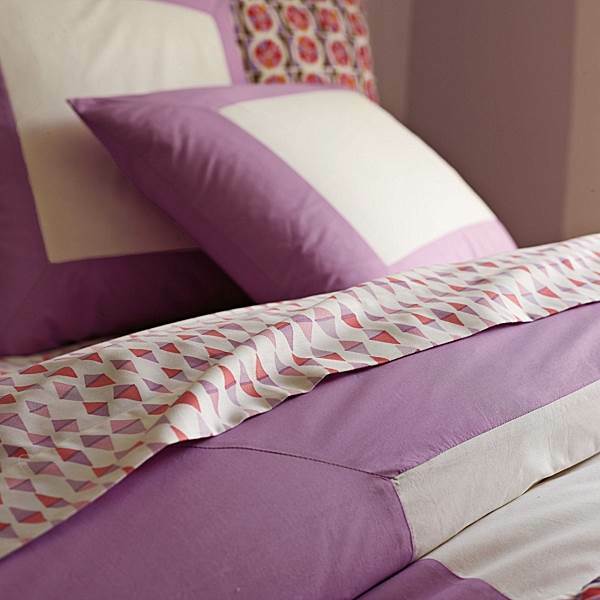 Another kids’ choice with grown-up appeal is the Lilac Color Frame Duvet and Shams from Serena & Lily. 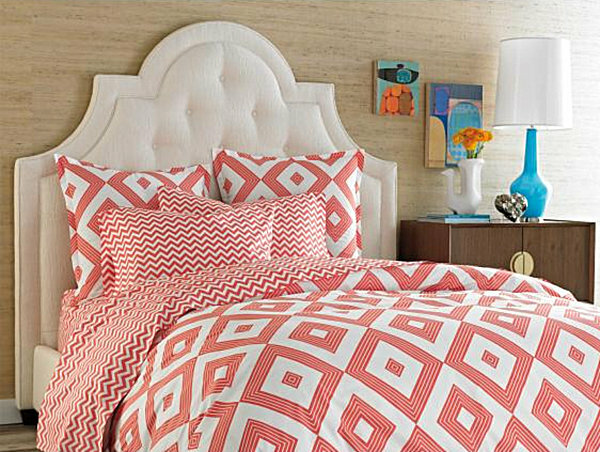 The lavender bordering is irresistible, but we have to admit that we’re drawn to the geometry of the Kite Sheet Set, which features a touch of coral. From scales to honeycombs… Nature is a great source of inspiration, isn’t it? 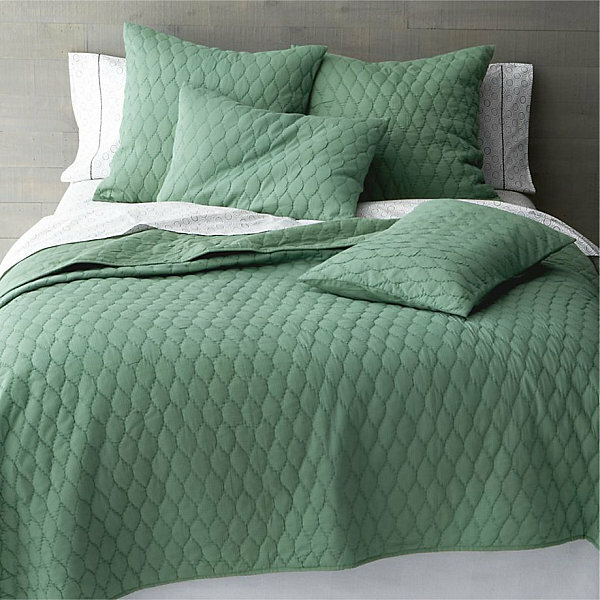 These D’abeille Bed Linens from CB2 feature a honeycomb pattern that stretches vertically across this duvet cover and sham set. This selection is perfect for those who want a touch of patterning without going overboard! 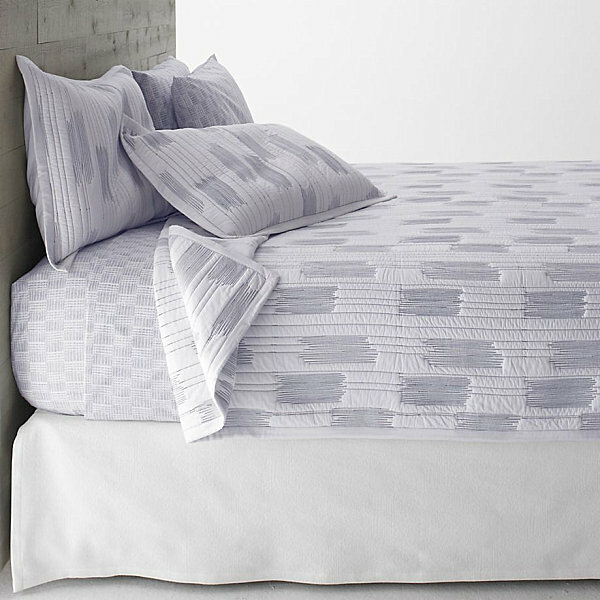 Interlocking forms cover the Grey Parish Duvet Cover from Jonathan Adler. A white background makes the pattern truly stand out, yet the soft grey shade keeps it in check. 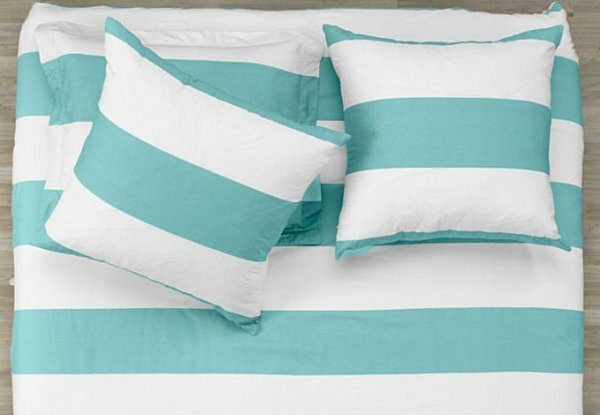 With a 400 thread count, this 100% cotton percale item is the ultimate in refreshing, crisp comfort! 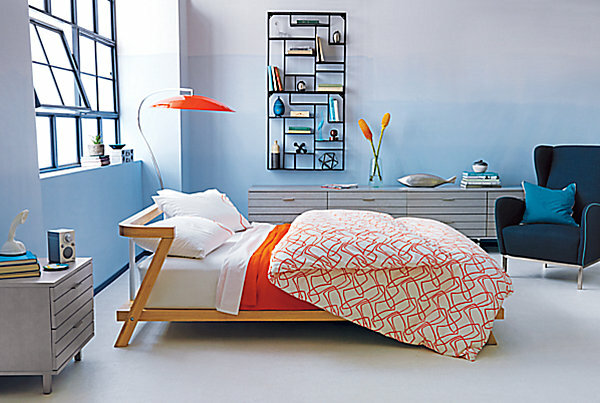 We remain in orange territory as we showcase the Crazy Talk Bed Linens from CB2, created by Chicago-based designer Noël Ashby. In fact, this energetic pattern is inspired by the hum of conversation. We’re inspired by the modern flow of the print! Our final featured bedding brings a touch of lavender to the boudoir. 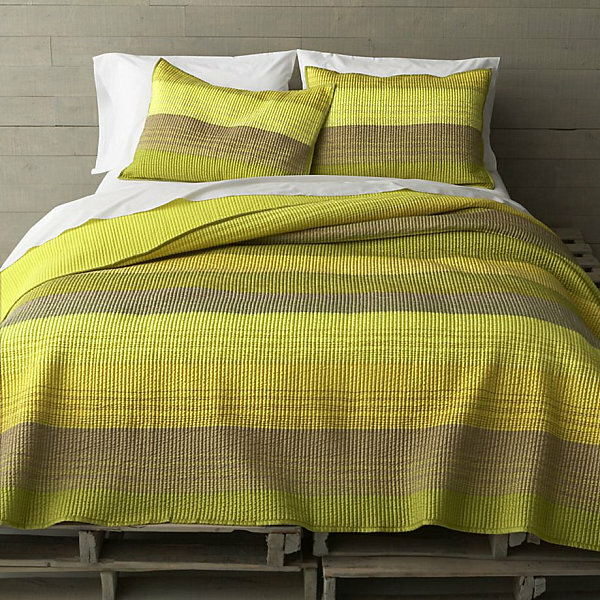 The Stitch Bed Linens from Crate & Barrel seamlessly combine lines and zigzag blocks. The result is an unusual pattern that makes a big statement yet remains soothing at the same time. 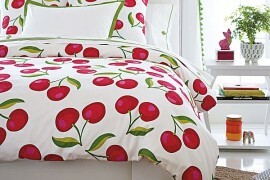 And if you’re wondering about the comfort of this bedding, note that it’s 100% cotton!